We're a nostalgic bunch, aren't we? I'm speaking of movie geeks in general, but I suppose, more specifically, those of us who were around decades ago to worship action heroes like Arnold Schwarzenegger and Sylvester Stallone when they were in their prime. Predator. Rambo. The Terminator. Cliffhanger. Total Racall. Rocky - not action, ok, but still tough-guy Stallone so it counts - and much more recently, The Expendables. And because, why not? Over the Top and Kindergarten Cop. With those films in mind, Escape Plan has its own nostalgic draw, taking two iconic action stars and setting them up in a Prison Break-like scenario. 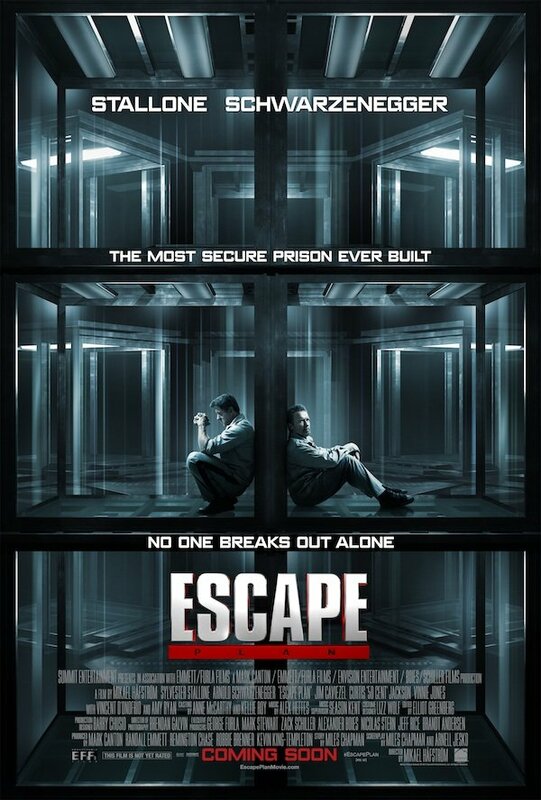 Above is the new poster for the film, which shows stars Schwarzenegger and Stallone in separate cells, their backs to one another while they're locked up in "the most secure prison ever built," where "no one breaks out alone." Directed by Mikael Hafstrom, Escape Plan comes from Summit Entertainment and centers on Ray Breslin (Stallone), an expert on structural security who agrees to take on "one last job," which involves breaking out of an ultra-secret, high-tech facility called "The Tomb." He ends up getting wrongly imprisoned, which leads him to recruit Emil Rottmayer (Schwarzenegger) to help him devise a nearly impossible escape plan. Something tells me it'll require a bit more than a rock hammer and a Rita Hayworth poster. Late last summer, we got our first glimpse of Schwarzenegger and Stallone together. The new poster indicates that Summit may be getting ready to show us a bit more from this film, as the October 18 release date inches closer. In addition to Stallone and Schwarzenegger, Escape Plan stars Jim Caviezel, Vincent D'onfofrio, Sam Neill, Vinnie Jones, 50 Cent, Amy Ryan and Faran Tahir.